Oh boy I didn’t know what I was getting myself into when I started reading this book. I thought this book was going to be like the last book that I read that had a ‘mystery’ flare to it, but boy was I wrong. This book is suspenseful and thrilling and will have you wanting to leave your lights on as you read the book at night. The books focuses on a survivor of a serial killer and how these strange things are starting to happen when she returns back home. Sasha had been through Hell and back and is trying to move on but it’s not as simple as that. While Armentrout dabbles in the struggles that it was for her to move on, there wasn’t that much struggle that we saw. After watching crime shows based on real events, I would have expected more of a struggle for her to trust people, but she whole-heartedly trusted everyone that she once knew before she moved away. Also, I would have liked to have seen more of that struggle because it helps develop the character seeing where they were and where they are now. It would be an Armentrout book if it didn’t have some romance in it. Cole is trying to make up for a mistake that he made when Sasha was first attacked and promises himself that he will not let her down again. We get to see him try and move past the guilt that he had carried with him the 10 years since the event and the continued guilt as he can’t figure out who is harassing Sasha. He is all alpha male and definitely not someone that you want to mess with. The ending to the book is the best part of the book. Throughout the last 20% or so of the book, you start to uncover more of the truth about who is harassing Sasha. You start guessing the truth about what happened and try to figure out how it all fits together. When you finally get to the truth, you start kicking yourself because the answer was right in front of you but you were too gun-ho on one person when it’s really someone else. I love when that happens. I hate when I figure out who the bad person is because it seems anticlimactic. 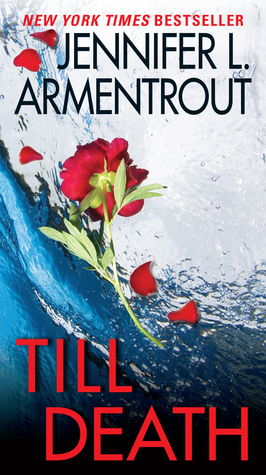 I love that Armentrout dabbled in something different and I hope that she does a book like this again. I love that the book shows the range that Armentrout has with her writing and that she can write over different genres. This entry was posted in Books and tagged Jennifer Armentrout, Till Death.